Elixir Door and Metals Company has excelled in Entrance doors. With a large assortment of sizes and window options; we can meet your needs. Elixir Door and Metals Company believes a beautiful home should have a beautiful entrance door. We have a wide selection of entrance doors that will meet the most stringent of criteria. 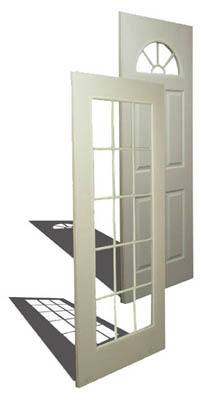 Select Elixir Door and Metals Company divisions will custom build exterior entrance doors to customer specifications. Elixir Door and Metals Company offers a variety of window styles in patio doors, french doors, triple doors, single and double sidelight doors, and transoms. We produce our own door slabs at our Douglas, Georgia facility in a variety of finishes, including our popular 9 mill vinyl steel series. Contact your nearest Elixir Door and Metals Company division for complete details on our exterior entrance doors.